In her early thirties, Elizabeth Gilbert had everything a modern American woman was supposed to want - husband, country home, successful career - but instead of feeling happy and fulfilled, she was consumed by panic and confusion. This wise and rapturous book is the story of how she left behind all these outward marks of success and set out to explore three different aspects of her nature, against the backdrop of three different cultures: pleasure in Italy, devotion in India, and on the Indonesian island of Bali, a balance between worldly enjoyment and divine transcendence. Eat Pray Love is a 2010 American biographical romantic comedy-drama film starring Julia Roberts as Elizabeth Gilbert, based on Gilbert's best-selling memoir Eat, Pray, Love. There have been some wonderful books with the theme of self-discovery through travel, as in Eat, Pray, Love by Elizabeth Gilbert. Their journeys have been life-changing for them and perhaps also for the reader. 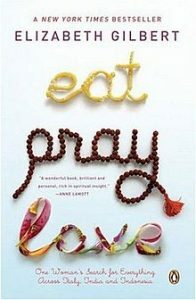 Check out these suggestions for other books like Eat, Pray, Love.